Tender bites of chicken and mushrooms enveloped in a basil pesto sauce. With only 5 ingredients and the help of your electric pressure cooker you can get dinner on the table in minutes. We like to eat this over orecchiette pasta. Pour chicken broth into the Instant Pot. Add in the chicken and mushrooms. Salt and pepper the chicken and mushrooms lightly. Cover the pot and secure the lid. Make sure valve is set to sealing. Set the manual/pressure cook button to 10 minutes (thawed chicken breasts) or 12 minutes (frozen chicken breasts–see note below) on high pressure. When the time is up let the pot sit there for 10 more minutes and then move the valve to venting. Remove the chicken and slice it. Add it back into the pot. Stir in the pesto and mozzarella and tomatoes. If you’d like to thicken the sauce combine cornstarch and cold water in a small bowl. Mix until smooth. Then turn the Instant Pot to the saute function. Stir the cornstarch slurry into the pot. The mixture should thicken up in a couple minutes. Salt and pepper to taste. 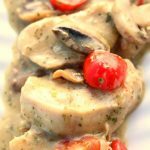 Serve chicken, sauce and mushrooms with pasta, potatoes, rice or quinoa…or plain. If you are using those mammoth-sized frozen chicken breasts you may need more time to get the chicken cooked all the way through. I had one larger chicken breast and one smaller one. The smaller one was cooked through but the larger one was still a little pink in the middle. I sliced it and added it back into the pot on the saute function. It cooked in the same amount of time it took for the cornstarch to thicken the sauce.